These lentil veggie nuggets are perfect for the picky toddler in your house. (Or picky adults too!) Dip them in some ketchup, Vegenaise, or Homemade Tahini! Kids love dipping, and I find it’s one of the easiest ways to get a toddler to try new things. They don’t even need to know that these nuggets are completely wholesome and protein packed. I gave my fourteen month old some ketchup and he devoured 3 of these bad boys in no time! Plus these nuggets are dairy free and plant based, making them suitable for anyone with lactose intolerance or on a vegan diet. AND they’re oil free, and baked, NOT fried! Put your lentils to soak in boiling hot water first. Let them sit for about 30 minutes before draining them. In the meantime, start prepping your veggies and breadcrumbs. Place your bread slices in your food processor and process until a breadcrumb consistency is achieved. Then transfer to a large bowl. Now add the carrot and zucchini to your food processor with all the seasonings, and your drained lentils. Process until broken down and well combined. Then add this mixture to your bowl of breadcrumbs, add the corn and peas to the same bowl if you haven’t already. Mix everything with a spatula before forming your veggie nuggets. Using your hands, make balls, roughly the size of golf balls and place on your prepared baking sheet. You will form about 20 balls. Once you’ve used up all your batter, flatten each ball gently using your hands or a spoon, into a disc shape. Use caution to avoid breaking them, and reshape if necessary. Then bake in your preheated oven for 15 minutes before carefully flipping them. Return to the oven for an additional 10 minutes and let rest at room temperature for at least 5 minutes to allow your veggie nuggets to firm up. Then go ahead and enjoy! 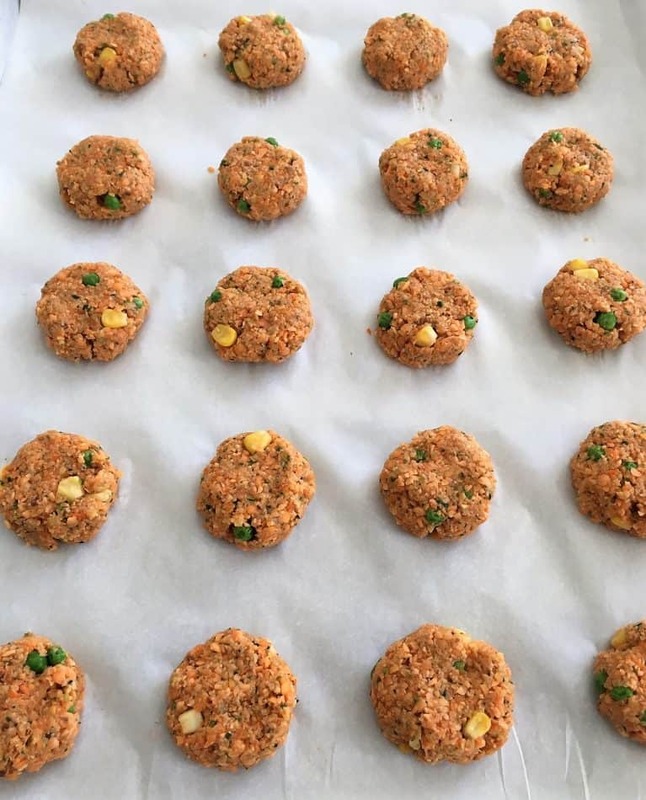 For the picky toddler (or adult) in your house, these lentil veggie nuggets are sure to be a winner! Perfectly tasty, yet made using wholesome ingredients. Preheat your oven to 425 degrees F and line a large baking tray with parchment paper. Add your bread slices to a food processor and process until a breadcrumb consistency is achieved. Then transfer your bread crumbs into a large bowl, add the frozen corn and peas to the same bowl and set aside. 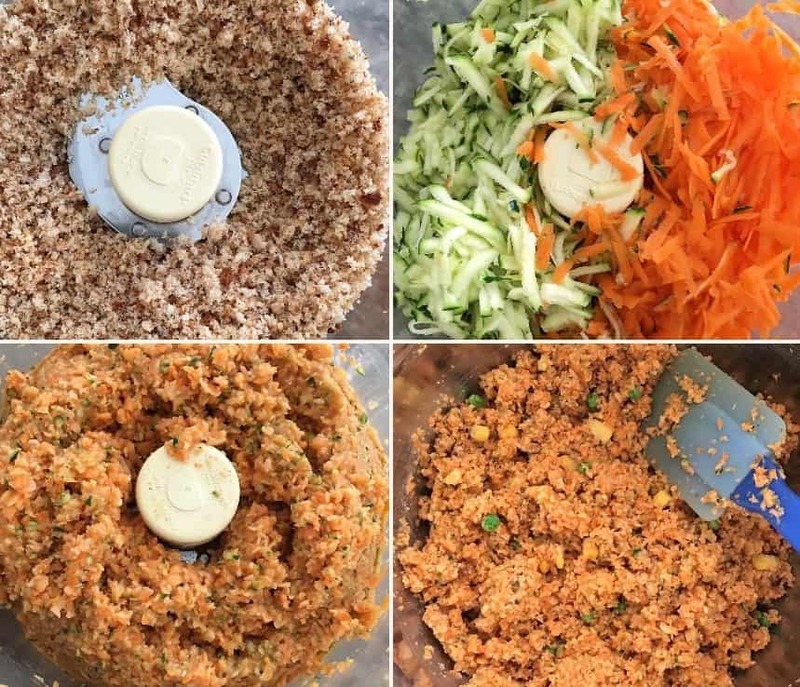 Drain your lentils and add them to the food processor along with your grated carrot, zucchini and all the seasonings. Process until broken down and well combined. Then transfer to the bowl with the breadcrumbs, and mix to combine. Form 1-1.5" balls using your hands, and place them on your baking tray. Then press each one down gently, without breaking them, to form your nuggets. Bake for 25 minutes, carefully flipping them at the 15 minute mark. Let your nuggets cool at room temperature for at least 5 minutes to help them firm up. Then serve with ketchup, veganaise, or tahini. Next Next post: 10 Healthy Breakfast Recipes That Are Also Vegan! how well do these freeze? 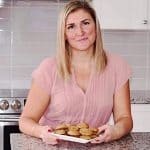 Should they be frozen before cooking or after? Hi Joseph, I haven’t tried freezing them yet but I would try before baking. My kids loved it! Such a huge hit at my house! What a fantastic healthy idea for children and adults alike. I can’t wait to try these out! Thanks so much, hope you enjoy!